Chief rabbi and preacher of Pfersee, Bavaria; lived at the end of the seventeenth century. His sermons for the festivals of Passover, Pentecost, and Tabernacles were published with those of his father, Enoch ben Abraham, under the title of "Reshit Bikkurim" (Frankfort-on-the-Main, 1708). 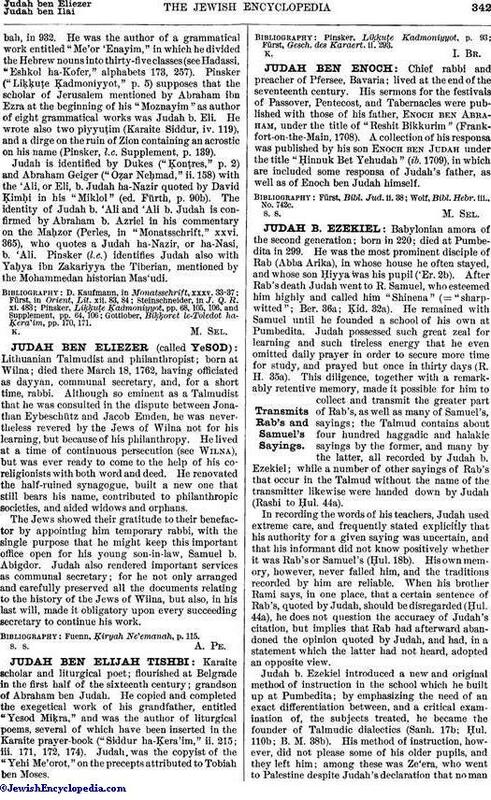 A collection of his responsa was published by his son Enoch ben Judah under the title "Ḥinnuk Bet Yehudah" (ib. 1709), in which are included some responsa of Judah's father, as well as of Enoch ben Judah himself. Wolf, Bibl. Hebr. iii., No. 742c.